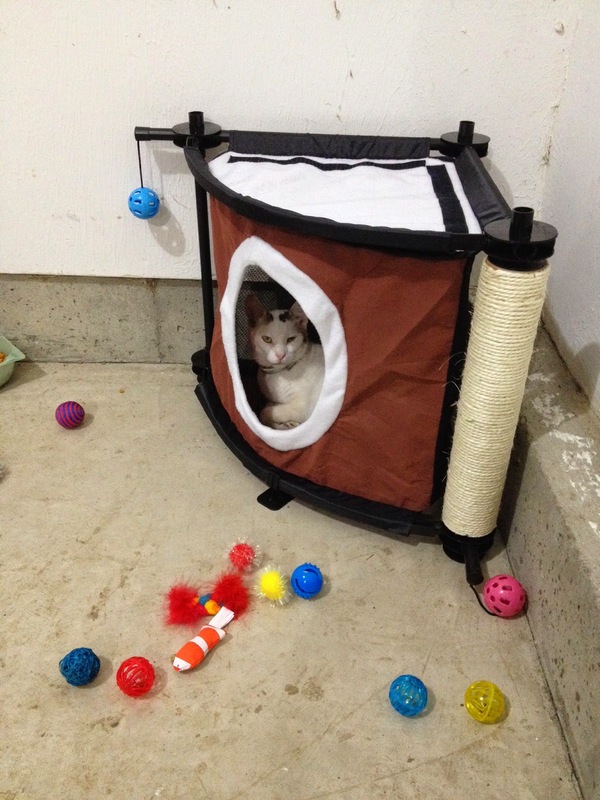 New study: FIV & Non-FIV Cats Can Live Together! Since I have NOT read the exact study, I can only paraphrase from a recent cat's veterinary newsletter. The gist: according to new research by Dr. Annette Litster, BVSc, PhD, FACVSc, assistant professor of Small Animal Internal Medicine and Director of Maddie's Shelter Medicine at Perdue University, FIV is not transmitted between infected and non-infected cats who live together! Right now, many rescues and shelter groups keep FIV positive cats secluded from non, believed there could be transmission of the disease...but now that is proven to be incorrect. For the person looking to adopt, now does NOT have to worry about mixing non with positive, except the possibility of health problems brought on by the FIV virus. I think this is fantastic news! Think of the folks who feed outside cats, but were worried about mixing the potentially FIV-positive felines in with their home cats. Except for deep bite wounds, there is no transmission of the virus. They cannot get it from sharing litter boxes, food bowls, and group grooming. Humans cannot get FIV from cats either, or unintentionally spread it to other cats. The automatic euthanasia of FIV-positive cats can stop...read again...can STOP. This new study was published in The Veterinary Journal for August, 2014. I found out about it via Catnip, from the Cummings School of Veterinary Medicine at Tufts University. I have also read some anecdotal stories of folks who mix positives with nons for years, and never had a problem, but now the veterinary world can get on that same page. YAY! 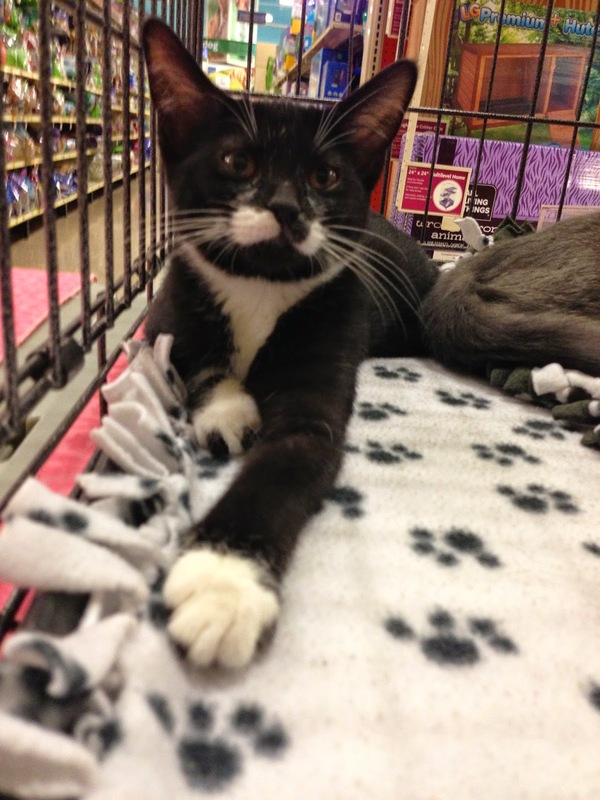 Oh, and check out William of Mass Destruction; there are two new kitties joining the family! Congrats to William, Caroline, Elliott...and their human momma too...on adding brothers who are seriously bonded. They are so cute! Squee! What do you do when there is a stray cat...with kittens...in your yard? Nina embarks on a journey, like so many of us did, by feeding the family and providing shelter. 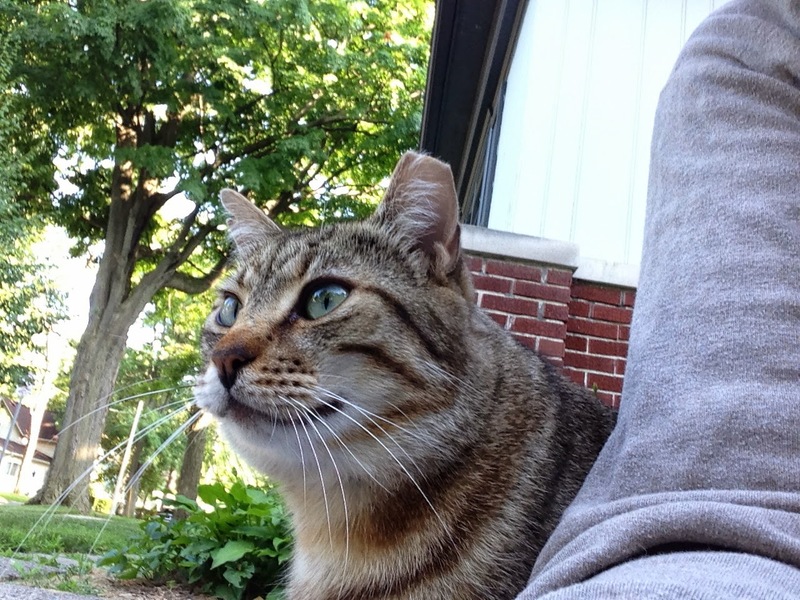 Then she learns about TNR, takes a class, and the story takes off. 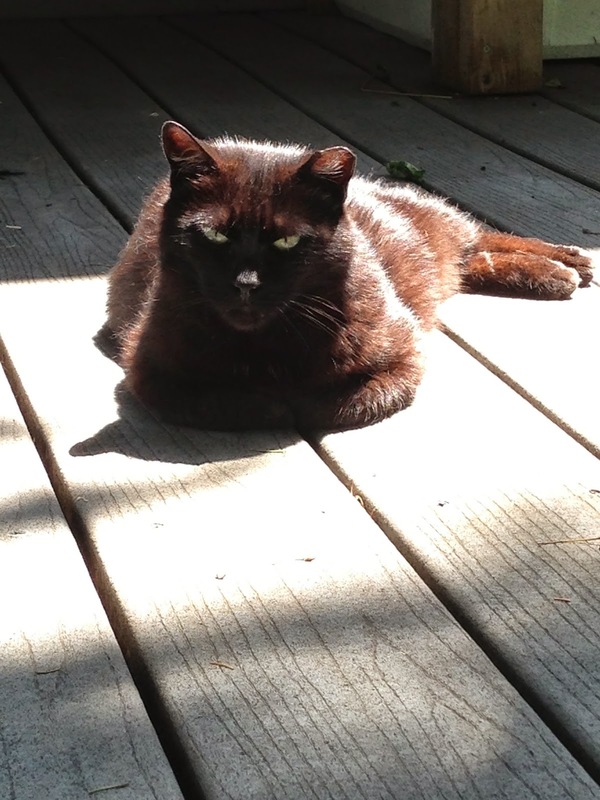 Recounted for our reading pleasure, Nina discusses her inner turmoils, and love, that comes from trying to help feral cats in an urban setting. 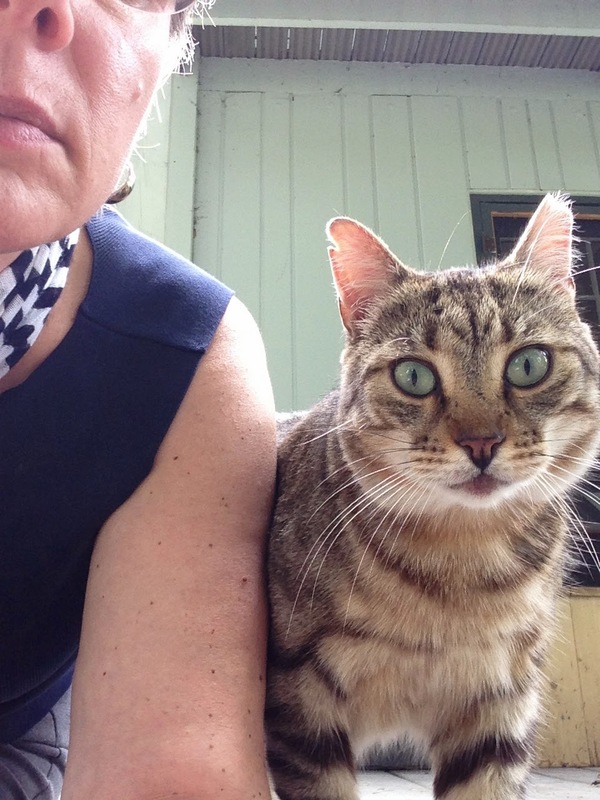 Family members, friends, and neighbors are woven in and out of Nina's desire to help the cats. There is hilarity, passion, tears, and some just plain dumb luck, and I identified with her every move and feeling. 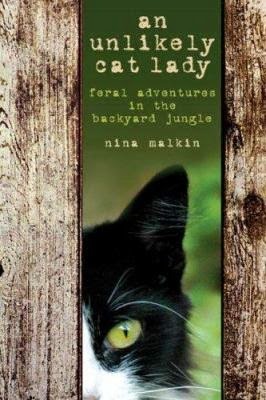 This is not a recent book, but look it up in your local library or used-book store, and give yourself a couple of hours to walk with Nina and her husband as they try to make a home in their backyard for some Brooklyn cats. I enjoyed the story, and I know you will too. Go to http://www.ninamalkin.com/ for more information about all of Nina Malkin's writings. Today, I paid the credit card bill for Sammy's visit to the veterinarian. I also deleted from my phone the last live photo I have of Sammy, taken when he was in the drop trap and getting ready to move into the humane trap (covered in an old brown sheet). Of course I have the image saved on my computer, but it's kind of like he's leaving me all over again. Who knew I was so sentimental? The top photo is a screen from my phone, which I plan to keep for a very long time. Sammy now rests peaceful in the heart-shaped box on top of my dresser. 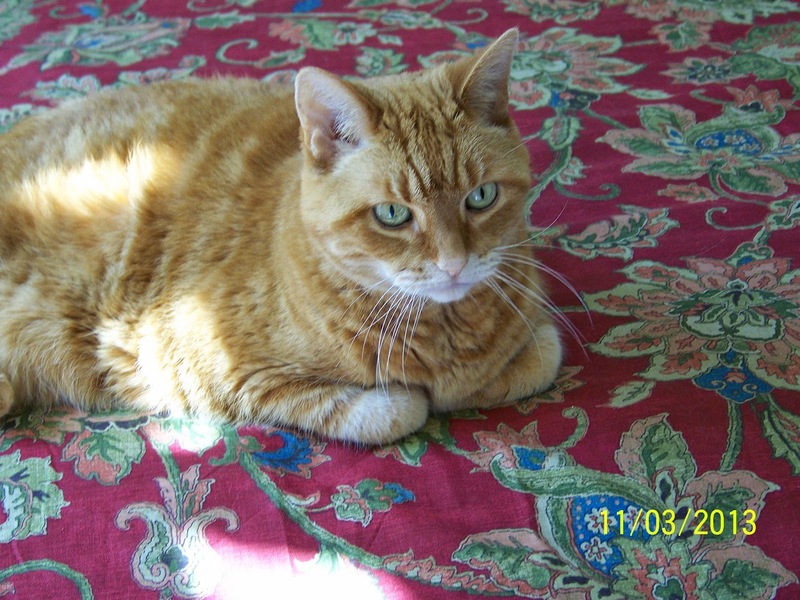 I KNOW he's wondering why I am making such a fuss over his passing, because cats do not think the way humans do. 'Cause I miss you, big guy! You may remember a recent post, entitled "Niece On The Job! ", about a found friendly stray kitten. I am very happy to report he's been named Mr. Magoo, and her last text to me, niece said: "My parents said we are keeping him instead of taking him to the shelter!" Super news! I cannot wait for new photos, and an update on how Mr. Magoo is settling in. Yay, Mr. Magoo, and kudos to niece and family for adding another member! And, Sugarbear's humans express their thanks for all the purrs sent their way. The two images at the top were taken last night. Mia just wanted to be left alone! I took the video today at lunchtime. This was a short attack; often, she heaves like that for minutes, and many, MANY sneezes or coughs. I believe it is asthma...what do you think? She's only half-feral now, but I cannot hold or touch her more than a few quickie strokes on her back or a scritchy under the chin. Time to read some more homeopathic books to see if there is an herb or combination of herbs that I may be able to add to her food to help. On the happy side, thanks for the greetings sent for Angel and Chuck. They don't care for birthdays, and I wish I could emulate their casualness toward gaining another year. But here's some sad news: Sugarbear in FL was too sick to stay here on Earth, so she's crossed the Rainbow Bridge. She was 15 pounds when first diagnosed with kidney failure, and was down to just over six pounds yesterday. A few purrs would help the whole family, so send some along. My heartfelt condolences to P and M, and the rest of Cat Crew. Happy 10th Birthday, Angel and Chuck! Very Happy Birthday Wishes to my sweet kitties! A can of cat tuna for dinner tonight, with kibble garnish! Check out the cute top I found, for knocking around the house. It's incredibly soft, which makes perfect pajama-wear. A bargain from a re-sale shop! Don't be jealous, Sheebie from Katnip Lounge! 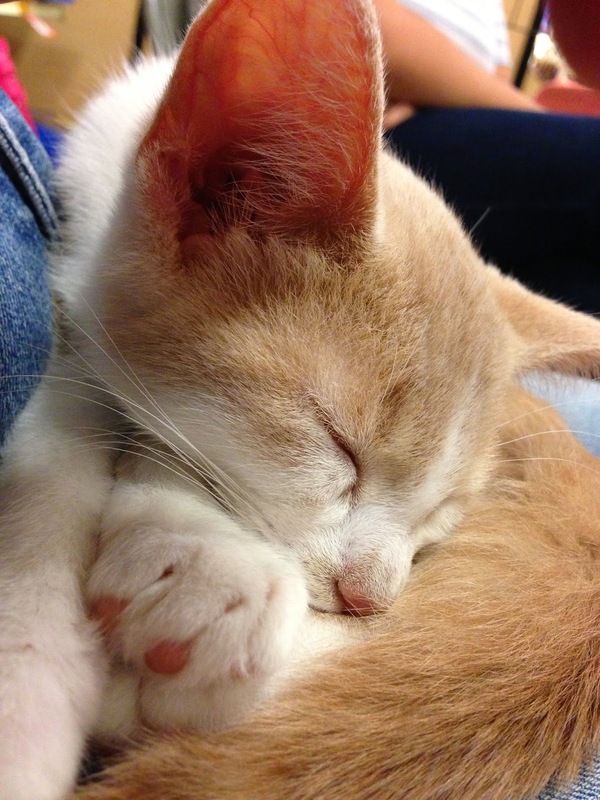 Next, the photo of Graham was taken while he was asleep IN MY LAP! Yep, my lap, and it was a joy to have him there for a long time. Little Annie was just so adorable too. Both looking for a furrever home! Once again, I joined the Paws for the Cause crew this weekend during their adoption event. 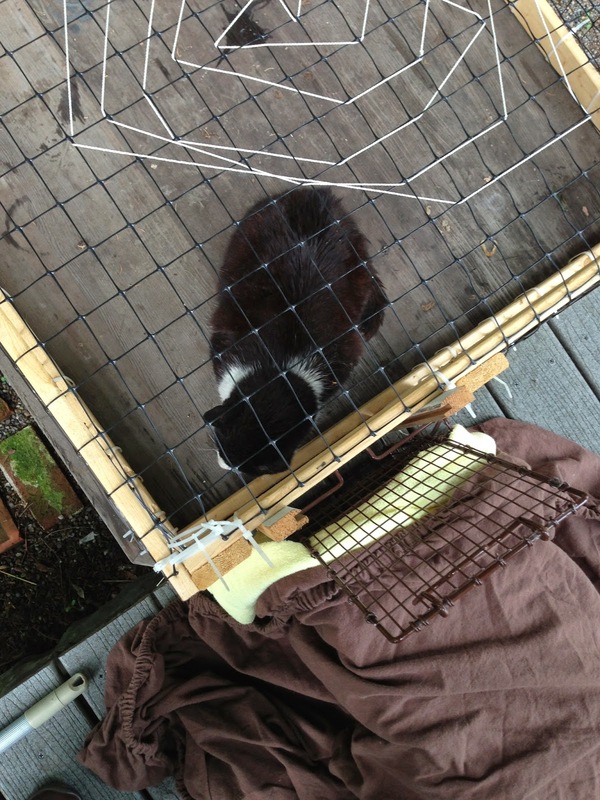 Their big project last week was to trap an entire feral colony, to relocate them to their new home on an organic farm. The old property was sold to developers, and will soon have large equipment moving around. Re-trapping feral cats is NOT easy, since they avoid the traps! Also, a feral cat colony must be contained for a period of time, since they can run away to find their old location. Fortunately, the farm has a suitable place where the cats will have lots of room and shelters, but they won't be able to get out. Once they are acclimated to the new surroundings, then they will remain close at hand. And then a photo of Angel, taken just moments ago. She is my honey-bunny, my little cookie, my floofy sweetie. She's just plain cute! Received a text from my niece, with the above photo attached. 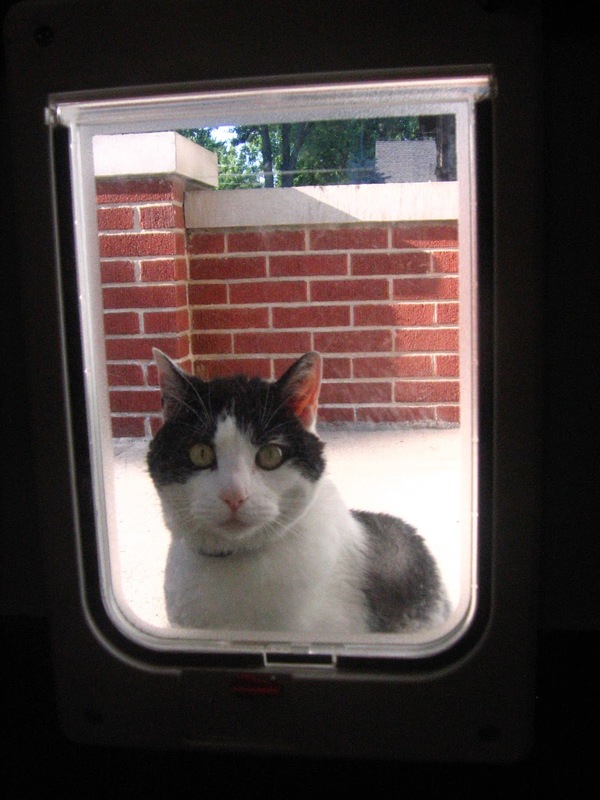 The text read, "A feral cat started meowing outside our window today! I thought about you! 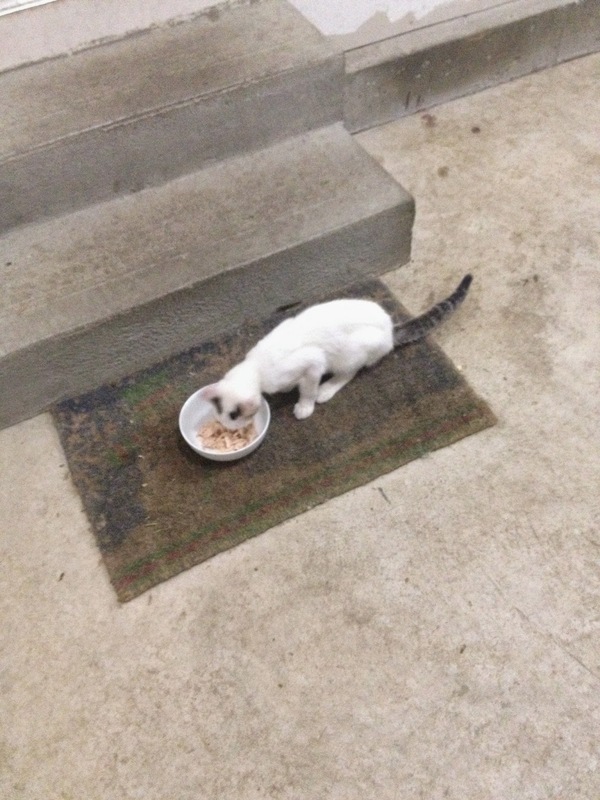 I fed him and I hope I can take him to the vet to get him neutered and adopted!" I sincerely hope she is able to complete her stated mission, and if one kitty is saved, then that's a GREAT THING! My niece has volunteered at an animal shelter near where she lives in Ohio, and she works at a doggie-day care. I am immensely proud of her, and am glad that a little bit of her crazy-lady-with-cats auntie has helped her to imagine helping an animal in her our backyard. Her parents have done a terrific job in raising her and her two brothers, and my only wish is that I could visit with them more. Thought of Groucho Marx when I saw the photo; look at those big eyebrows! Isn't it funny the way his tail looks like it belongs to someone else? When I hear more, I'll pass the news along. 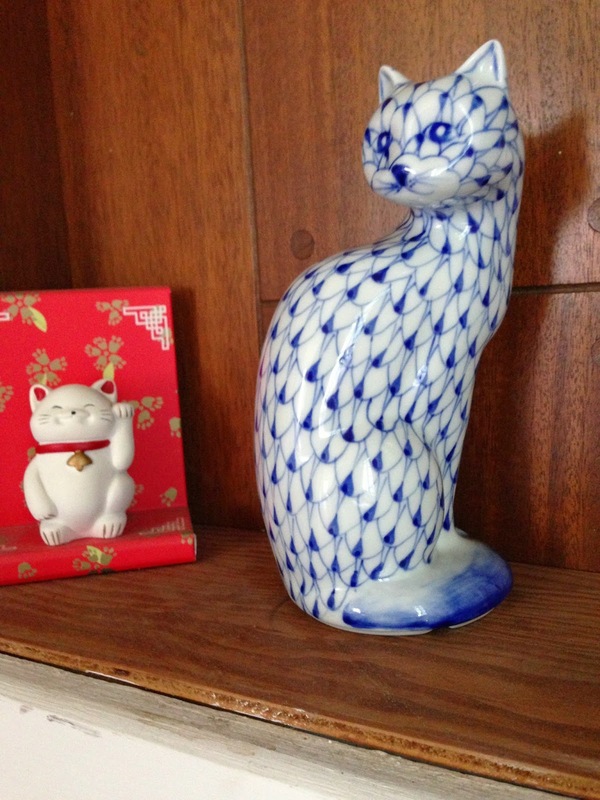 The blue porcelain cat was only $5! On July 4, with a day off from work, my friend and I went SHOPPING! Good sales everywhere, but we were hunting in the resale shops. Looking to update our wardrobes, we spent some money and had a great time together. I managed to purchase a blue-and-white porcelain cat, so I added it to my wall of cat stuff. 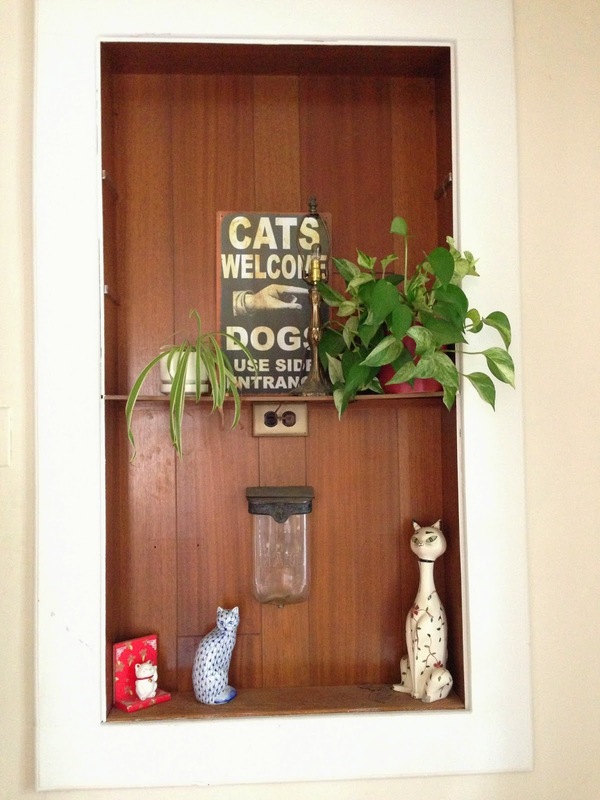 The 'Cats Welcome' sign was found at a garage sale a few weeks ago. The maneki-neko was a gift from my sister and family for an important birthday, and after setting it on the shelf, I found a job a couple of weeks later. Coincidence...? I think not! That's why it's still sitting there after four years! The cat painted with flowers was found in the basement; we think it was an art project by one of the hubby's sisters years ago. Oh, and the glass thing in the middle is an antique mail box, which was still is use on our house until we decided it was too valuable to allow to remain outside. Glass mail box...how weird is that! The now mold-free and freshly painted Cat Hotel is airing out; all seams are caulked. While home at lunch today, the deck was Mama Mia's lazy spot, and she allowed me to snap some photos of her...until Patty got between us again! 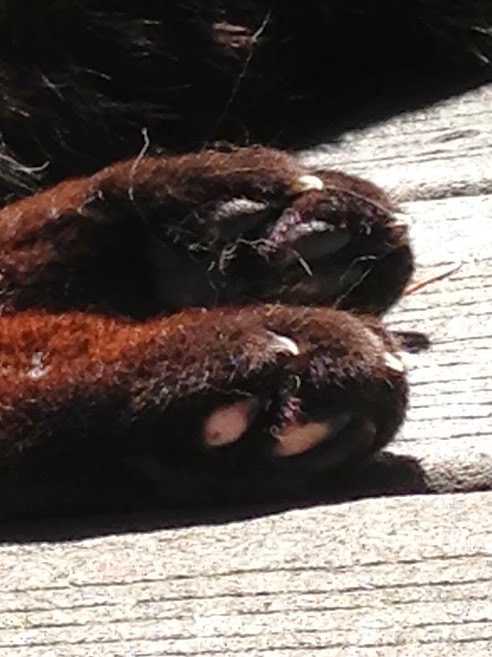 Mia was limping for a few days; looks like she may have scuffed her toe pads on one foot; they usually are dark brown/black like the rest of her. Today she is walking totally normal, and both Mia and Patty appear to be in good shape—perhaps my worries about the mold affecting their health may have been a bit overwrought. I'm such a helicopter cat-mom! Patty O'Malley is a clown. He's got no shame, and enjoys himself to the maximum. Whenever I am around, he's right there at my elbow. Other than rolling on the ground and nuzzling my armpit, Patty's third favorite pastime is photobombing Mama Mia. Even while the hubby and I tore apart The Cat Hotel, scraped and cleaned, painted and caulked, Patty just sat a few feet away to watch, and nap. Apparently, he's feeling just fine. Such a funny fellow, and I love him dearly. Mousies! It's MOLD! The Cat Hotel has it, so we've stripped everything out, and given it a good wash, then a bleach bath. The hubby has made a new lid, since the old one was why water leaked in. It was totally gross, and I apologized to Mama Mia and Patty O' for giving them less than stellar accommodations. Tomorrow, I will paint the inside with stuff that kills germs and mold, and seals the wood. Once that has properly dried, we'll reinstall the flooring and fill it with clean, fresh straw. 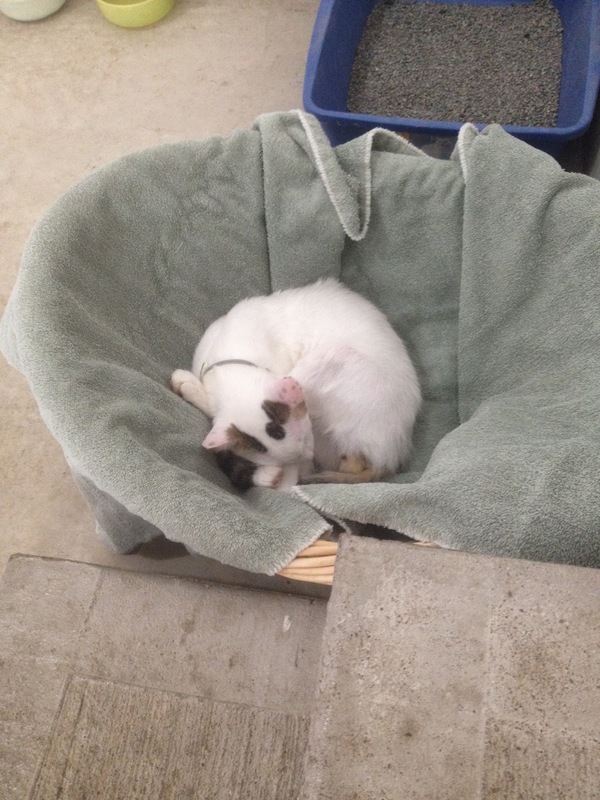 Fortunately, we still have the old insulated shelter built five years ago, so the 'o' cats have a place to crash during the renovations. And I've been worried about their health recently. Mama was sneezing, and it sounded like she was underwater. Patty has been quieter, almost introspective, and his lymph nodes under his chin are a bit swollen. And why shouldn't they be sick, surrounded by slimy mold!? Oh!!!! If I hadn't have been nosey and popped open The Cat Hotel top to see how the straw was holding up, I wouldn't have guessed there was a problem. When I saw—and smelled—the mold, it was all hands on deck between the hubby and I to throw out everything inside, then wash and bleach. To help boost their immune systems, I add a bit of powdered Vitamin C, a sprinkle of Echinacea and Goldenseal, some granulated L-Lysine, and a spoonful of nutritional yeast to each meal. Now that they are no longer exposed to mold, I am hoping they both improve. Yikes, just thinking about it is giving me the willies! They both are eating just fine, btw. Mousies! P.S. Angel is hiding in the corner of the bathroom, under the claw-foot bathtub. She HATES fireworks. Chucky is ignoring them, except the really big, deep ones that rattle. Patty O' and Mama Mia are simply lounging on the deck. Obviously, they can tell the difference between fireworks and thunder. Happy July 4th, everyone! I hit some good sales today, so I'm pretty pleased (a future post! ), except for the mold thing. Mousies! Chuck and Angel were born July 18, 2004. And I just recently noticed that the markings in her fur look like a cat! On her other side, Angel has a round dot, which earns her the occasional nickname of "Dottie"